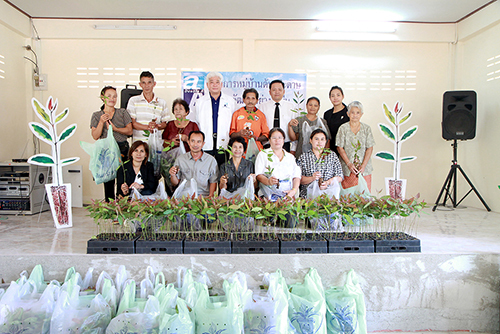 Sakaeo, Thailand, 7 December 2016 – A new village has officially been added to the list of local communities under Double A’s Village Fund initiative when Non Mak Kheng, a small community in Sakaeo province, accepted the 77,000 paper tree saplings from Double A.
Mr. Charnvit Jarusombati (3rd from left), Senior Executive Vice President (SEVP) of Double A was accompanied by Mr. Nattapong Pattanarat (4th from right), District – Chief Officer and Ms. Khanittha Sengsri (2nd from right), leader of Non Mak Kheng Village, in handing over the paper tree saplings to the members. The Village Fund model is an inclusive platform where farmers – big or small, and community members who owns unused small plots of land – are welcome to participate. Like the Paper from KHAN-NA, Village Fund allows the members to grow trees in and around their rice fields, however, unlike the former, members can plant the trees on unused small plots of land in the village such as school compounds and temple grounds, thus creating a viable income source for the members. Like all the other farmers in the village, Mrs. Tavorn Pewdging’s income comes from rice and cassava. She also grows paper trees under the Paper from KHAN-NA program which serves as her secondary source of income. Having heard of the Village Fund from the village chief and the opportunity to plant some more trees, Mrs. Pewdging immediately heeded the call. “My rice and cassava fields are surrounded by 2,000 paper trees. The money from trees goes to my household expenses and children’s education. In fact, I was able to financially support my two daughters through university using the hard earned money from growing paper trees,” shared Mrs. Pewdging. Double A’s Village Fund is an example of how a corporate core strategy can create a win-win situation with small holder farmers and communities; local farmers earn from utilizing unused resources, while Double A benefits from having an increased supply of sustainable trees that are traceable and legal. Ms. Khanittha Sengsri, the leader of Non Mak Kheng Village, fully supports the program and encourages the community members to participate. “I was influenced by my father who used to grow paper trees. I tried it for myself and the results have been great. Double A Paper-Tree is a good alternative source of income especially during off-season or while waiting for the main crops to grow and mature,” shared Ms. Sengsri. Double A introduced the Village Fund program in 2014 with the objective to create self-sustaining villages across the country. Today, 843 villages across Thailand are part of this initiative, and the number is growing.